Prakash Chand Kandpal is currently a faculty at the Department of Political Science, Dyal Singh Evening College, University of Delhi. He holds a PhD from the University of Delhi. He has been awarded a doctoral fellowship by ICSSR and a postdoctoral research award by UGC. 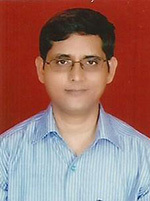 He has coauthored four books with Professor Bidyut Chakrabarty: Public Administration in a Globalizing World (SAGE, 2012), Indian Administration: Evolution and Practice (SAGE, 2016), Public Policy: Concept, Theory and Practice (SAGE, 2016) and Public Administration: From Government to Governance (2017). His research papers have appeared in various national and international journals including Indian Social Science Review, Social Change, Social Action, Urban India, Indian Journal of Public Administration, Administrative Development, Research Journal Social Sciences, Gandhi Marg and so on. He was shortlisted for Dr V. K. R. V. Rao Awards in Social Science Research for the year 2015 for his contribution in the field of Public Administration. His areas of interests are public administration, and environmental policy and politics in India. Currently he is pursuing a major research project (sponsored by ICSSR) on policy and politics of air pollution in Delhi. His research primarily focuses on the politics of urban environment in contemporary India.